Despite several rainy days, a marshy area through Neale Mittelheuser’s farm near Childers is now yielding about 100 ML a year of additional irrigation water for the farm. “The catchment dam has a capacity of about 22 ML and it can fill within a few hours,” he says. “We started work on the project in 2008 and finished last year. “The wetland was probably once a creek but over the years it has silted up and become a marsh,” says Neale. “Water has always run through here and now we can collect it for irrigation. The waterway leading through the farm to the dam is about 250 m long and covered with grass and trees. Initially Neale thought they may build up the dam wall another three or four metres and back up more water but he decided against this plan, preferring to keep the vegetation as a filter for any silt that might come with the water. The dam is about 15 m deep and Neale has installed a new pump and electric motor. Connecting the new dam to the existing mains pipe only required about 40 or 50 m of new underground pipe. Neale expects to source about 100 ML from the dam each year, making a significant contribution to the irrigation supply for the farms. “We have a good allocation on this red soil farm of 420 ML but the other farm only has 190 ML,” says Neale. The project cost a total of about $60,000. 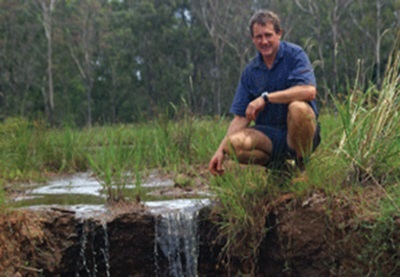 Neale applied for, and was granted, $5000 from the federal government’s Reef Rescue project, and $10,000 from a wetlands funding package administered through the Burnett Catchment Care Association and CANEGROWERS Isis. Neale farms in partnership with his father, Dudley, who comes up from Hervey Bay for a few days most weeks. The red soil farm includes the 12 ha wetland area that has never been used for agricultural production. When mains irrigation came to the Mittelheuser’s farms in 1991 they changed the row direction and now most of the runs are 530 m long. They were one of the first growers in the Isis district to use Upton boom irrigators with two 80 m wide booms on the red soil and a 100 m wide boom at Farnsfield. “In the early years we had a few problems with the booms tipping but now we have a groove in each headland for the front wheel to run along and I rarely even check them at night,” says Neale. 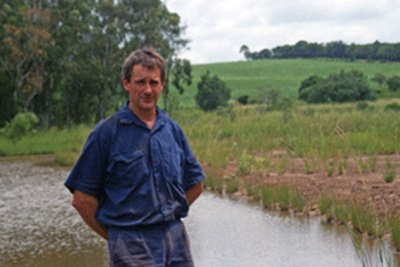 The Mittelheusers have searched for groundwater on the Farnsfield farm to help supplement irrigation but did not find any useful quantities of water so having access to the water from the catchment dam has made a real difference. In the recent rain the only erosion on the red soil farm was in the plant cane because the rest of the farm, with slopes as high as 30°, is well protected by a thick trash blanket.